The catalog of known exoplanets has absolutely exploded in the last decade. Out of these discoveries have come two profound pieces of information. The first is that there are at least as many planets in our galaxy as stars. More unexpectedly, many of these extrasolar planetary systems appear totally exotic compared to our own. Astronomers have found everything from hot Jupiters to systems of tightly packed inner planets (a well-known example being TRAPPIST-1) to gas giant worlds with inclined orbits. Amidst all of these exciting discoveries, it is important to keep in mind that our detection methods are biased. The vast majority of exoplanets so far have been discovered with either the transit or the radial velocity method. Both of these techniques are sensitive to large planets on short period orbits. In fact, the very first exoplanet discovered around a Sun-like star was a Jupiter-sized world on a 10 day orbit! 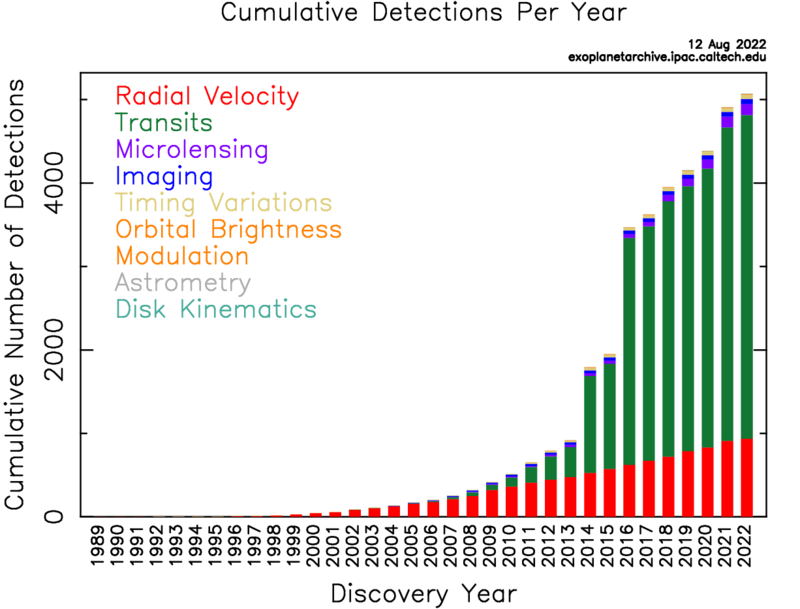 It is very likely that there are more planets in many of these systems that are simply evading detection. Rocky exoplanets are small and dim. Because of this, astronomers must often turn to computer simulations in order to understand how and where they can form. The authors of today’s paper are interested in whether these worlds can form and coexist alongside inclined giant planets. That is, planets whose orbits don’t lie in a nice, flat plane like we see in the Solar System. Specifically, the authors ask whether this environment can produce terrestrial planets that also have inclined orbits. Figure 1: The effects of two high inclination giant outer planets (black) over time. The giant planets quickly stir up the planetesimals (blue) and embryos (red). By the end of a simulation, a single terrestrial planet (green) is produced on a high inclination orbit. The gray bar shows the location of the habitable zone for a sun-like star. The inset at the bottom shows the mutual inclination between the inner giant planet and the terrestrial body over the course of the simulation. To answer this question, the authors run a series of 126 simulations using the N-body integrator SyMBA. Each simulation begins with an inner disk of planetesimals and protoplanets orbiting a Sun-like star. Exterior to the disk, the authors place two giant planets in various orbital configurations. Some configurations start out with planets that are inclined, while others leave them in flat co-planar orbits as a control case. These starting conditions are generated with a numerical migration model, which accounts for the effects of the gaseous protoplanetary disk and the early gravitational interactions between the giant planets. This extra step ensures that the starting configurations are physically realistic, although it adds an extra layer of complication when trying to understand how the different orbital parameters actually affect the final results. In particular, the highly inclined giants tend to end up on rather eccentric orbits during this step. This makes it difficult to disentangle the effects of orbital eccentricity and inclination on the outcome of the simulation. Each simulation is run for 100 million years, during which time the planetesimals and protoplanets collide and merge to form full-sized terrestrial worlds. The typical evolution of a simulation that begins with two inclined giant planets is shown in Figure 1. Early on, the gravitational influence of the outer planets strongly excites the inclination of bodies in the inner disk. By the end of the simulation, a single body approximately 1/5 the mass of the Earth forms, with an inclination similar to that of the inner giant planet. There are some wacky dynamics going on here as well. The inner giant and the rocky planet oscillate in inclination until finally settling down at the end. Figure 2: This time, the giant planets start on low inclination orbits along with the rest of the bodies. The structure and color scheme of this plot is the same as in Figure 1. In this case, multiple terrestrial planets are produced. Around 40 Myr, a gravitational instability ejects much of the material from the system (including one of the giant planets). One of the terrestrial planets ends up on a high inclination orbit. In contrast, the simulations that start with all of the bodies on roughly coplanar orbits produce multiple Earth-sized planets. Interestingly, some of the terrestrial planets end up on highly inclined orbits. This is not a typical outcome, however. The evolution of an initially coplanar system that produces an inclined terrestrial world is shown in Figure 2. Between 40-50 million years, a gravitational instability completely ejects the outer giant planet. This leaves the inner planets on rather extreme, but stable orbits. A summary of the planets produced with the suite of 126 simulations is shown in Figure 3. 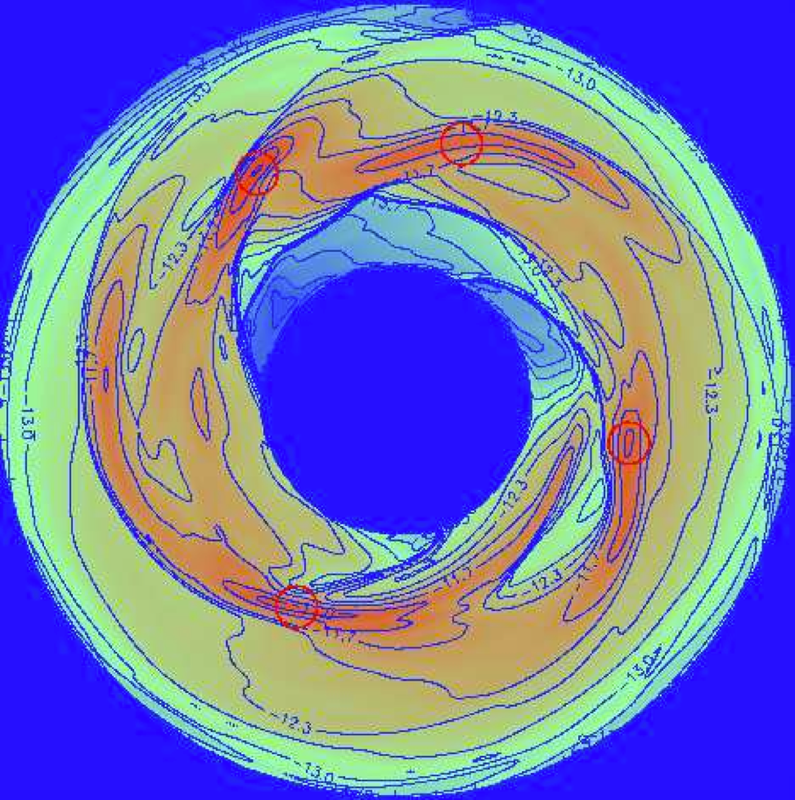 In general, the coplanar simulations create planets that are larger and have mostly flat, circular orbits. There are some exceptions. In the presence of inclined outer giants, the planets produced are small and tend to have more extreme orbits. In these cases, the outer planets strongly perturb the inner disk. This ends up ejecting a significant amount of material that otherwise would have been used for planet building. Where to look for terrestrial planets? To answer the original question of whether rocky planets can live alongside inclined giants, it certainly seems possible! In addition, some of these systems are even able to produce terrestrial bodies with inclined orbits. This is also a potential, but less likely outcome with a more Solar System-like setup. The gravitational influence of the inclined giant planets, however, ends up removing material that would otherwise be used for planet building. Finally, the authors point out that their assumption of perfect accretion – that every collision results in a clean merge between two bodies – may not be a safe assumption here. In particular, one could imagine that high velocity collisions between bodies on wildly different orbits may be rather destructive. At the very least, these results show that it’s worth taking a harder look for terrestrial planets in systems with inclined giants. Figure 3: The final eccentricity and inclination of all of the terrestrial planets produced across all simulations. The size of the points indicates the mass of the planet. Simulations which started with low inclination giant planets are shown in white, while simulations with highly inclined giant planets are shown in black. I'm a member of the UW Astronomy N-body shop working with Thomas Quinn to study simulations of planet formation. In particular, I'm interested in how this process plays out around M stars, which put out huge amounts of radiation during the pre main-sequence phase and are known to host extremely short period planets. When I'm not thinking about planet formation, I'm an avid hiker/backpacker and play bass for the band Night Lunch.